One hallmark of a successful comic book franchise is when the universe has lasted for so long that writers and artists get together and create incredible “what if” scenarios for the chosen characters to live through. Whether it’s pitting one superhero against another to see who would win in a fight or creating a third-party threat to create allies of convenience between rivals, fans can expect an engaging story. Planet Hulk is one such imagined scenario. Now fans of the comic can enjoy the storyline – almost in its entirety – as an animated film on Blu-ray. It just won’t look as good as the comic books. In the animated version of Planet Hulk, the green titular hero (voiced by Rick D. Wasserman) is exiled from Earth for being an uncontrollable destructive force and sent by spaceship to another planet that is devoid of life. Hulk doesn’t like that idea and in his rage he damages the flight navigation computer, sending his craft through a wormhole to the distant and desperate planet Sakaar. The travel saps Hulk’s strength and makes him vulnerable to damage, rendering him helpless when the local military capture him and force him to fight as a gladiator for the entertainment of the Red King (voiced by Mark Hildreth). During the many battles, Hulk befriends fellow gladiators and they fight together to try to win their freedom and the freedom of Sakaar’s people. Fans of the comic book story will be mostly pleased by the film adaptation. The animated version, however, does not include the events that take place after fighting the Red King. A few characters are also missing, like the Broodspawn as well as Miek’s queen. The Silver Surfer has also been replaced by Beta Ray Bill. The overall plot is left intact and makes for a fun – if not familiar – story. Unfortunately, the art doesn’t quite live up to the comic books, which is readily apparent in the ending credit sequence when comic book renders are used to highlight each character. While the backgrounds range from average to excellent, the characters look very two-dimensional and are only comparable to weekday afternoon cartoons. The art being what it is, some viewers may wonder why Blu-ray high definition was necessary for this film. Nevertheless, the animation is well done and captures all of the limberness and brutality one expects from a comic book. While the art isn’t always noteworthy, the writing is very well done and will manage to make viewers forget that they’re watching a cartoon. Characters are multifaceted and are faced with difficult decisions. Some characters even die horrible deaths, which are rarely seen in western animation. The deaths aren’t gruesome or gratuitous so parents shouldn’t worry about letting young ones watch. Overall, Planet Hulk is a decent addition to your Blu-ray collection, but will mostly be appreciated by comic book aficionados and younger viewers. Disc 1 is loaded with a ton of extras, including a “making of” featurette, audio commentary and a slew of videos and motion comics. 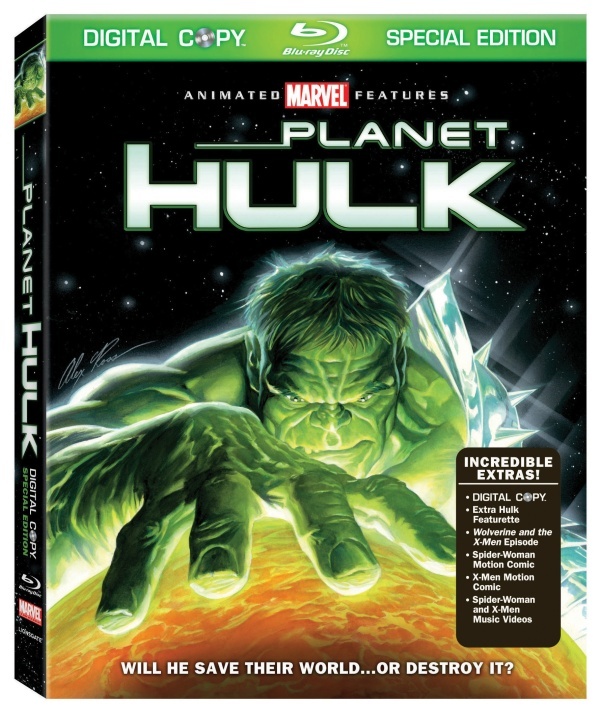 Disc 2 offers a standard definition digital copy so you can take Planet Hulk wherever you go.